Where most places in South Florida focus on letting in the pervasive sunlight, inside Sweetwater, the bar is brooding, framed by exposed brick, hardwood floors, and low light. Behind the bar, you're likely to find Sean Iglehart, a self-proclaimed bar man whose passion is mixology. It may take awhile to get a drink at this Boynton Beach spot, but that's because these handcrafted cocktails are among the finest around. 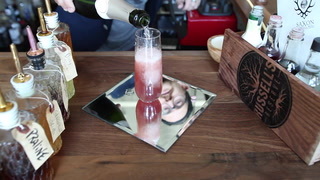 Quality ingredients like homemade bitters, fresh fruit juices, esoteric gins, or bitter Amaro go into classic recipes from yesteryear such as a Ramos gin fizz, made with Plymouth sloe gin, lemon, simple syrup, club soda, egg whites, and a garnish in a highball glass. Or go for the Aviation, a lovely concoction of gin and the purplish Creme de Violette. Allow yourself the time and piece of mind to savor one (or three).